A postcard showing off the main street of Madoc in about 1960 (a very good year), generously shared by fellow central Hastings County storyteller Russell Prowse. One of the absolute best things about being the creator, curator and general dogsbody here at Meanwhile, at the Manse is that quite often readers share their stories with me. This brings two large benefits. One, the stories are invariably enlightening and/or entertaining – whether they be about local (i.e. Queensborough-area) history, or about their own family history, or old-home-renovation success or horror stories, or memories from the mid-20th-century era when I was a kid growing up here at the Manse, or – well, whatever. And the second big benefit is that these stories provide me with interesting new material to in turn share with the readership as a whole, and thus to build up the amount of shared knowledge and anecdotes that one can find right here at Manse Central. And of course, stories that come in and are shared tend to prompt even more memories and stories. It’s a productive and happy little process. The old Pigden Motor Sales sign that made a brief reappearance during renovations to the exterior of the building’s current occupant, Bush Furniture. Now if that isn’t the kind of comment to gladden a blog writer’s heart, I don’t know what is! Of course I responded to Russell’s comment on the blog. But I also sent him a private email – when people post comments, I am able to see their email address, though other readers are not – thanking him for his kind words and issuing a hearty invitation to send along that vintage picture postcard of main-street Madoc. Which he did! Now, it turned out that it was a picture that had crossed my path before, and that I’d written about after discovering it framed and hanging in the Madoc used-book store The Bookworm; that post is here. But my photo of it at the time of that post, back in 2014, was basically a picture of a picture, reflections in the glass and weird angle and all. Thanks to Russell scanning the postcard, you can see the real thing at the top of this post, and it is a lovely trip back in time for anyone who remembers Madoc in the middle of the last century. My connection with Madoc is due to my family’s yearly summer visits to Steenburg Lake, north of Madoc, near the hamlets of Gilmour and St. Ola. Our Mom would drive us up from Toronto on the last day of school and we’d return on Labour Day. We were so lucky. We have been going there for sixty years now, starting when I was about five, and we still own our cottage. The postcard (probably purchased at the Rexall) just slightly pre-dates my strongest memories of the street: I don’t remember Cafe Moira, but I certainly remember the Madoc five and dime for its bags of plastic toy soldiers and beach paraphernalia. I remember Stickwood’s, where we could buy Bell brand (as in Belleville) flannel shirts. I would look at the records at Pigden’s, and buy my comics at Johnston’s Rexall. But across the street, in Rupert’s, the other drug store, where the really, really nice white-haired man worked, I would gaze, week after week, with deep longing at an outstanding collection of harmonicas on sale. Harmonicas! Eventually I bought my first Hohner Chromatic there with, I suspect, a little financial help from him (the Chromatic’s the one with the little push button at the side, like Stevie Wonder plays, and it isn’t cheap), and the white-haired man tossed in his friendly encouragement as a bonus. I wish I could remember his name. I’ll never forget his kindness. Our shopping day was Thursday, I think, and that meant lunches at Richard’s Restaurant, SW corner of 62 and 7, which we called Johnny’s because we believed that was the name of the man who ran it. I’ll have a turkey sandwich – all white meat, please – on white with fries and a chocolate shake, and excuse me but I have to get up and put a another dime in the jukebox for another play of “Surf City“. That would be the third play, actually, but nobody seemed to mind. I bloody loved that place! My Dad was the type of guy who went out of his way to get to know people, and that included Kel Kincaid. They were a lot alike, kind of boisterous and sometimes a little too in your face for some. But my Mom and Dad got to know everybody who worked at the Red & White and later the IGA and when we finally got a phone at the cottage they began the habit of calling ahead to the store’s butcher and ordering the week’s BBQ. They swore by “Madoc Meat”. At Steenburg (at the time, still known as Bass) Lake, about half the population of cottagers would make the trek north to Bancroft for supplies. But we always drove the couple of extra miles south to Madoc because we felt it was maybe a bit gentler, a bit friendlier. And for Mom and Dad, that lasted to end of their days. After Kel died and his daughter and son-in-law took over, the friendship continued and in fact they held a bit of a party for my parents’ 50th anniversary – a wonderful and sweet gesture. I have always felt as though the town was mine too, even though I would only engage with it for a few months a year. I have mourned the losses over the years of the buildings on that street, and the fading of the town. It troubles me. Because I love it. Anyway, the stories are just great. Thanks to Google Street View, we can all see what sausage-making operation extraordinaire Seed to Sausage of Sharbot Lake looks like. Sadly, the retail end of things isn’t open in the winter. But fear not: I have found a place to buy their products – possibly the best sausages ever! Ah, Friday night. Often it is a time for a musical interlude here at Meanwhile, at the Manse, as we try to have an entertaining and not-overly-demanding end to the work week. Tonight, however, instead of focusing on the pleasures of music, we’re going to focus on the pleasures of good eating. Good local eating, to be precise. Proof of how local the superb Seed to Sausage sausages are: the address of the operation, south of Sharbot Lake. As I wrote here, I discovered possibly the best sausages I’ve ever eaten, made locally to boot, at a food event held in Tweed this past September. The company that makes these extraordinary sausages is called Seed to Sausage, and it is based in tiny Sharbot Lake, about an hour’s drive east of Queensborough along Highway 7 (and then south a bit on Highway 38). Now, Seed to Sausage does have a retail outlet at the Sharbot Lake home base, but it’s closed in the wintertime. And it has an actual store in Ottawa, but Ottawa is far. And so I’d been hoping to find someplace closer that might have these delectable sausages – and now I have! And that’s what I am here to report this evening. Because I think everyone who appreciates a good sausage every now and then needs to know. So here’s the skinny (possibly the wrong word to use when one is talking about sausages): you can buy the products of Seed to Sausage at a new food store – it opened this past December – in downtown Belleville (249 Front St. to be exact) that is called Gourmet Diem. The store’s web page seems to be still under construction and doesn’t provide any information, but you can read about Gourmet Diem here, in a nice little story done by one of my students in the Loyalist College journalism program. 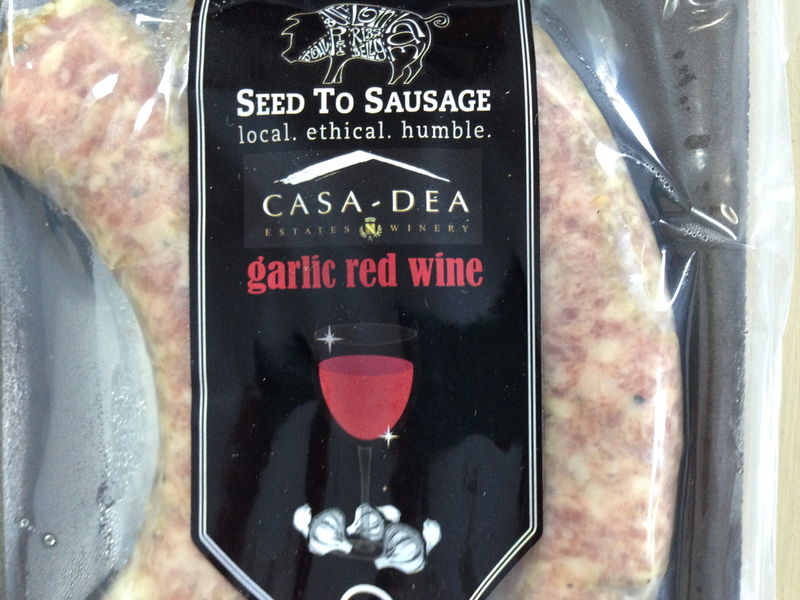 The Garlic Red Wine sausages feature wine from Prince Edward County. Nice! Raymond and I finally got a chance to try some Seed to Sausage products from Gourmet Diem just this past week, and I am very happy to report that both the Jalapeno Cheese Curd Smokies (made, as I reported in that earlier post, with cheese curds from Empire Cheese of Campbellford, possibly the best local cheddar-cheese-maker of all) and the Garlic Red Wine sausages (made with wine from the Casa-Dea Estates Winery of Prince Edward County) were superb. So there you go, fellow sausage lovers. Try them now, and thank me later. These are sausages that sing! I guess my mum was right. Electric frying pans may not be fashionable now the way they were in the middle of the 20th century, but our new model served its primary purpose – warming up tea biscuits – very well indeed. Doesn’t it look chronologically appropriate atop our 1970s Harvest Gold stove? When I was a kid growing up here at the Manse, one of the small appliances that was in extremely heavy rotation in our kitchen was the electric frying pan. My mum, Lorna Sedgwick, used it for all the things that many people would have used a non-electric frying pan for: that is, frying bacon and eggs, sautéing (canned) mushrooms, and making grilled cheese sandwiches. She also used it to fulfill what is now the primary role of the then-uninvented microwave oven: to warm up leftovers. And finally, she used it for what I have decided was its highest and best purpose, which was to warm up dinner rolls from the bakery or supermarket. Since I grew into a teenager as snotty and snarky as is the next teenager, I used to make fun of my mum’s use of this old-fashioned appliance. (Which, by the way, she had almost certainly been given as a wedding or shower gift; she and my dad were married in 1959.) I haughtily informed her that bacon, and most other things that one fried or grilled, tasted better when done in a cast-iron frying pan that sat directly on the stove. And also that in using such a pan (or its successor in my culinary life, the non-stick non-electric frying pan) there was no bother about an electrical cord and, besides, it was easier to wash up. But Mum always stoutly defended her electric frying pan, cord and all, and in fact does to this day. Can you see where I’m going with this? Of course you can. Guess who just recently acquired the very first electric frying pan of their lives? It’s Raymond and me, of course. Which means that once again there is just such a thing in that same Manse kitchen. The sign that caught our eye in Picton. Here’s how it came about – and in telling you the tale I might be doing you a shopping service. 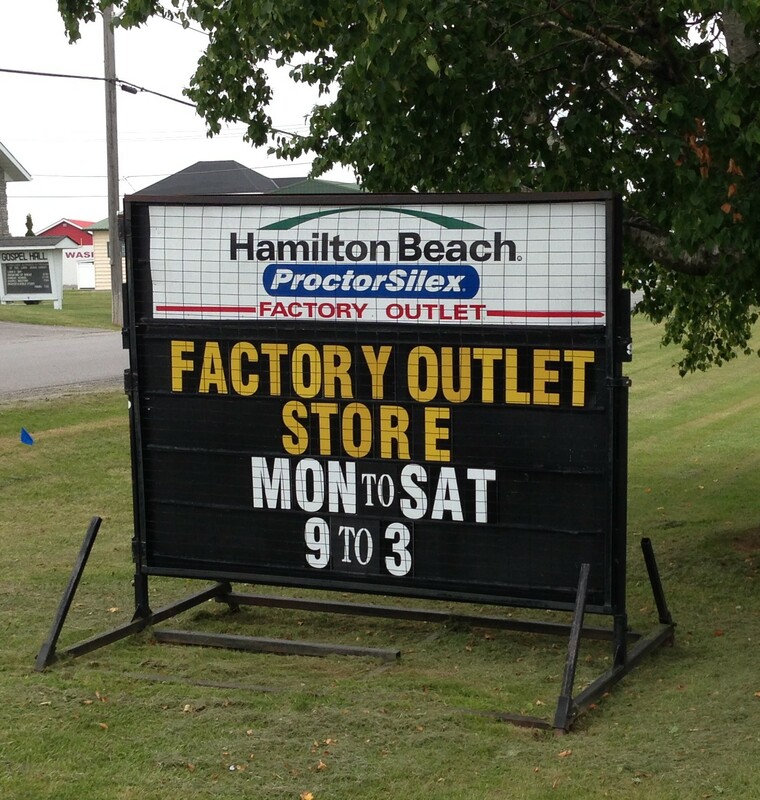 When Raymond and I were down in Picton, in neighbouring Prince Edward County, one day late last month, we noticed a sign for a “Proctor-Silex/Hamilton Beach factory outlet.” Well! Picton seemed like an odd place for such a thing, but that made it all the more important that we check it out. And sure enough, there, in an utterly nondescript building with minimal and unenthusiastic signage, was indeed a Proctor-Silex/Hamilton Beach factory outlet! 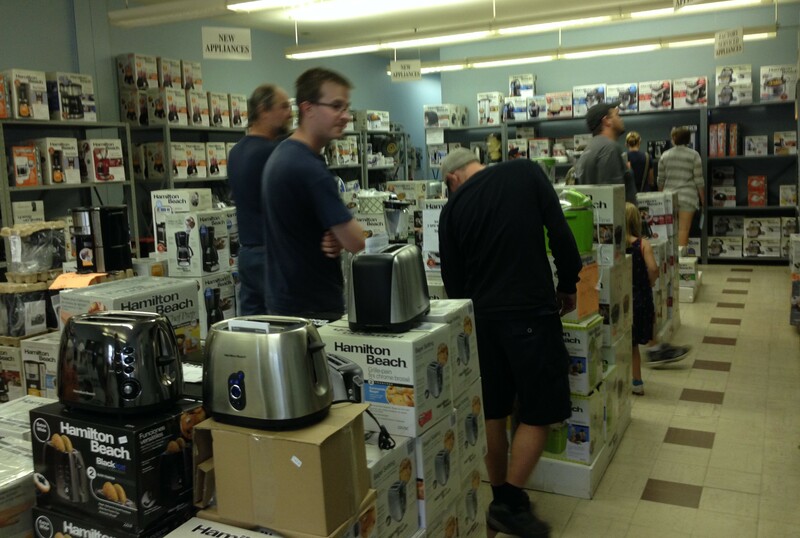 With all kinds of different appliances at pretty decent prices, especially the ones that were on back-to-school special. Wondering how the heck this happened to be, I asked a pleasant person behind the counter whether the “factory” of the “factory outlet” in the place’s title was also in the building, or at least in Picton. She told me that the appliances were all made elsewhere and imported, but that the Picton operation is the distribution centre for the whole of Canada. Now isn’t that something! Browsing at the factory outlet, where there are lots of small appliances. We left with three appliances: an ice-cream maker (electric, that is; not the kind that requires rock salt, a bucket, and endless hours of churning); a coffee maker (to replace our old one, which dripped coffee all over everything when you poured); and – yes – an electric frying pan. They were on special sale, you see. And as I noted to Raymond, we don’t have a microwave, so warming up leftovers is kind of a nuisance. 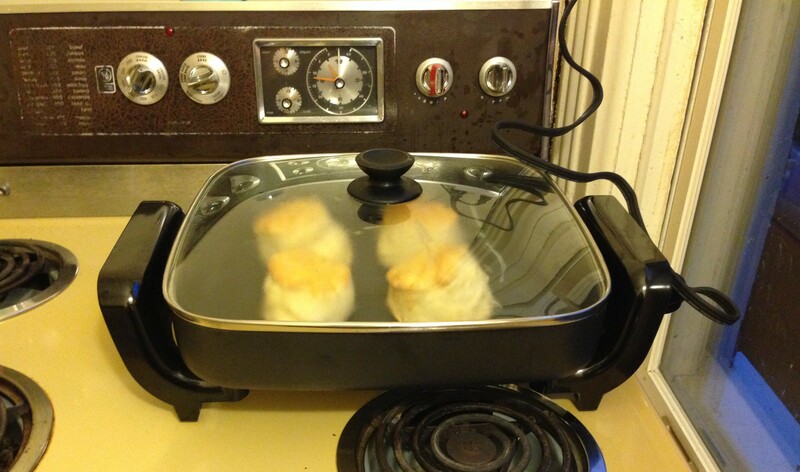 And way more to the point, there is no better way to warm up dinner rolls than in an electric frying pan. Why? Because the low heat you can set it to, and the lid you place securely on top, allows them to get warm while staying nice and soft – not too crispy, as happens when you put them in the oven, but not too mushy, which is the inevitable result of microwaving them. And how did I know this wondrous thing about electric frying pans? Because my mum told me, that’s how. Raymond and I put it to its first test this past weekend, warming up some buttermilk tea biscuits (yum) from Madoc‘s Hidden Goldmine Bakery to accompany the corn chowder that I’ve already told you about – the one that was delicious but would have been better had some slab bacon been available to add to it. Anyway, the tea biscuits were perfect. Raymond was happy. And my mum was right. Ah, the last days of summer. They are upon us, people. It is hard to believe how quickly July and August have passed. And now we have shorter days and cooler nights – and, looking on the bright side, the glories of autumn in North-of-7 Ontario soon to come. But hey, we still have the long Labour Day weekend to look forward to! And this evening I am here to tell you about an event that you should attend, should you be of a literary bent, or of a local-cultural-events bent, or of a Prince Edward County bent, or really if you’re just interested in something cool and different to do, on the Saturday of this Labour Day weekend. 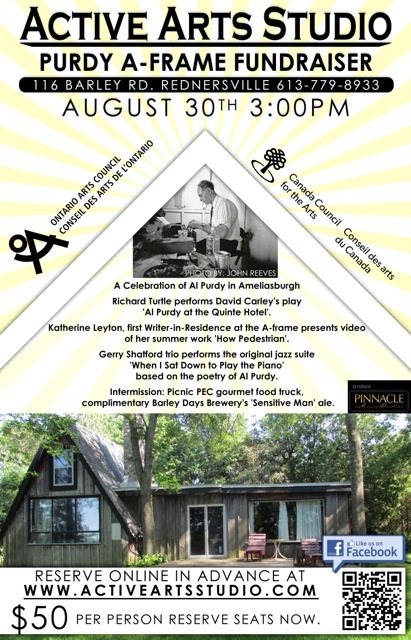 It is an event celebrating Al Purdy, perhaps Canada’s greatest poet and a local Hastings County boy (by way of Wooler – which, yes, is probably actually in neighbouring Northumberland County, but only just – and Trenton). Longtime readers will know that I am a huge fan of Purdy, in part because his famous poem The Country North of Belleville so perfectly describes the landscape where our beloved Queensborough and Manse are located. In fact, I’ve made so many references to Purdy and his work, and to Purdy-connected events, since this blog started that tonight I’ve gone and got myself organized and created a new Al Purdy category right here at Meanwhile, at the Manse. If you click on that category on the home page you’ll find all kinds of stuff by me connected to Al. Anyway: the event I’m going on about is a fundraiser for the Al Purdy A-Frame Association, a non-profit group that has done a miraculous job of preserving and restoring the very rustic A-frame cottage that Al and his wife, Eurithe, built on Roblin Lake at Ameliasburgh. That cottage, as I’ve written here, was the place not only where Al wrote many wonderful poems, but where he and Eurithe welcomed generations of Canadian writers, both established and famous and unknown but up-and-coming. It is a very important place in Canadian literary history – and for those of us in Hastings and Prince Edward counties (and Northumberland County and Lennox and Addington too) it’s right here in the back yard. While the cottage has been purchased and mostly fixed up, there’s still lots to be done – not only on the property, but to ensure the continuance of a new writer-in-residence program whereby young Canadian poets stay for a few months at a time at the A-frame, pursuing their literary work but also keeping the flame burning for Al and his legacy, and for the magic of poetry in general. Now, I could tell you all the detaila about Saturday’s event – which takes place at Rednersville, on the shores of the beautiful Bay of Quinte – but you can get a lot of it from the poster that you see at the top of this post. And what you really should do is check out the entertaining and enticing stuff in posts here and here and here and here at the marvellous Purdy-themed blog In Search of Al Purdy, written by our brilliant friend Lindi Pierce. I urge you to go enjoy those posts – and, if you’d like a good laugh, Al’s poem When I Sat Down to Play the Piano, which Lindi makes reference to in this one. Raymond and I will certainly be on hand for the event, having been involved to a greater or lesser extent (greater for Raymond, considerably lesser for me) in the A-frame project for the past few years. We’d love to see you there – and to raise with you a glass of a new beer being made by Prince Edward County’s Barley Days brewery in honour of Al, and to financially support the A-frame. Its unusual name, A Sensitive Man, is taken from Al’s legendary poem At the Quinte Hotel, wherein he proclaims himself (even as he is drinking rather large quantities of beer at that classic old tavern) just such a man. As I’m sure he was. Anyway, an afternoon of music, poetry, theatrical readings, food, celebration of Al Purdy, support of a good cause, and beer called A Sensitive Man – what more could you ask for on the last weekend of summer? 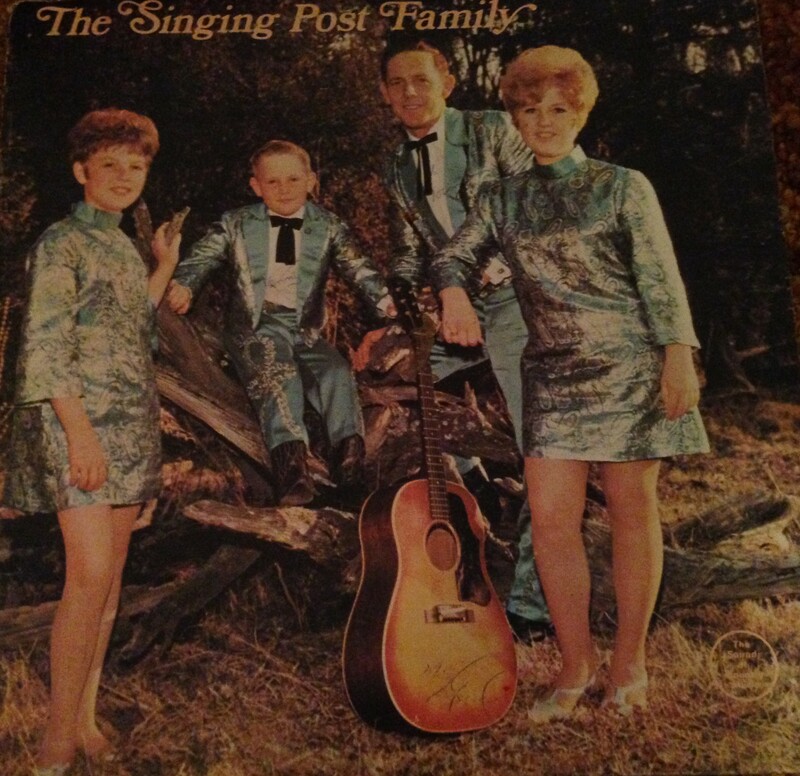 People, do the words “The Singing Post Family” mean anything to you? Because they were local performers, the Posts were doubtless regulars on the regional country-music circuit (fall fairs and jamborees), which in turn would explain why they were “names” to residents of this area. But I actually think their fame may have spread further, and I’d be interested to hear from anyone who might know more about that. Anyway, in the great tradition of family groups – the Carter Family, the Jackson 5 and of course the Partridge Family (Hahaha! Just pulling your leg) – the Posts were a real family band: Dad Norman, daughters Joanne and Debra, and son Kenneth. The record that I found at the thrift shop – which appears to be their first, given its eponymous title – unfortunately has no date anywhere on it, but the album cover says that they “started singing country music as a family in 1967,” so it has to be at least a year or two later than that. At the time of the record, again according to the album cover, Joanne was 17, Debra 13 and Kenneth 7. I was tickled to death to find my Singing Post Family album. It wasn’t in great shape, but given that I paid something like a quarter for it, so what? It was the memories that it brought back that mattered – and boy did it bring back memories! This baby has a whole bunch of classic country tunes on it. They’re all (as far as I can tell) covers of songs that much bigger stars first recorded, but the Posts definitely have that old-timey country twang, and I have to say they lend the right spirit to material like D-I-V-O-R-C-E (made monstrously famous by Tammy Wynette, of course), Green Green Grass of Home (sung by everybody back in the day, like some other songs I wrote about here, but quite famously by Merle Haggard), and Daddy Sang Bass, which Johnny Cash and the Carter Sisters were known for. Don’t it make you wanna go home now? Our bedroom almost every night. And her little heart pounding with fright. “Mommy and Daddy, can I sleep here with you? ‘Cause I didn’t come from a wealthy family. We kept chickens in a pen in the back, and everybody said we was po’ folks. 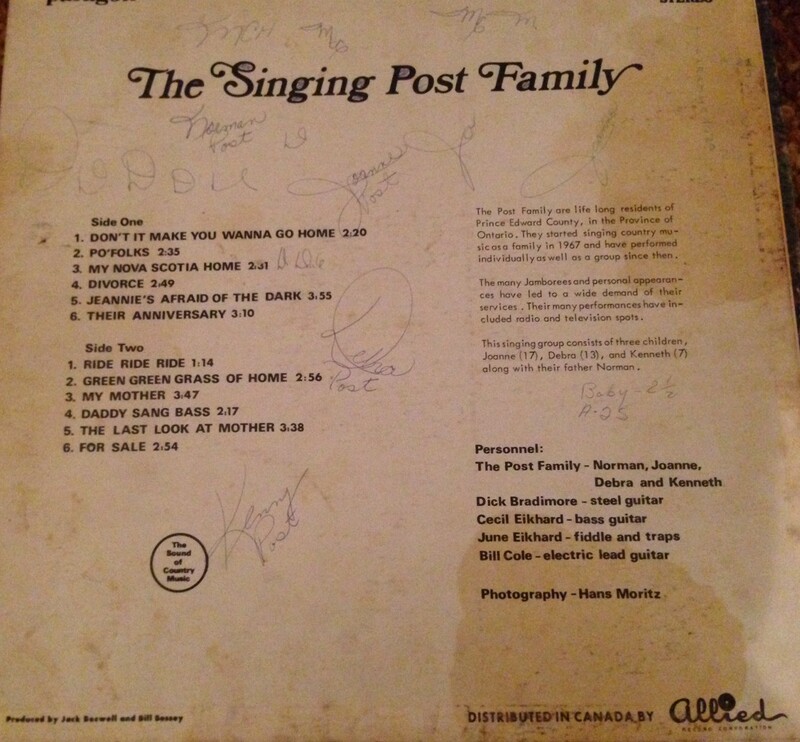 Anyway, now I’m not sure whether I recognized those songs, and others like them on The Singing Post Family, because of the original versions that would have been on the radio and on other people’s LPs and singles back in my childhood – or because of the local renown and well-known repertoire of the Singing Post Family. Whatever, I have to reiterate that Norman, Joanne, Debra (I think she was known locally by the familiar Debbie) and Kenneth (ditto: Kenny) had a great old-fashioned, down-home country sound, and I think they totally deserved whatever fame they found, locally or further afield. Their music sounds thoroughly retro to the modern ear. But hey – what’s wrong with that?